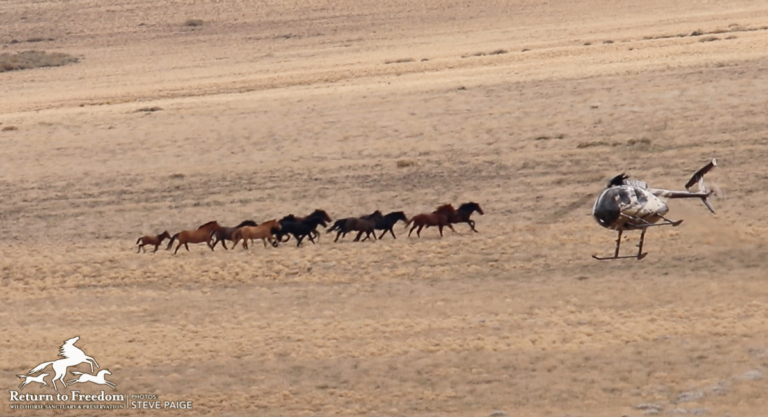 A helicopter pushes wild horses toward the trap on Oct. 2 in Wyoming's Checkerboard region. RTF file photo by Steve Paige. A helicopter pushes wild horses toward the trap on Oct. 2 in Wyoming’s Checkerboard region. Photo by Steve Paige. The Bureau of Land Management on Tuesday ended its helicopter roundup Salt Wells Creek / Great Divide Basin / Adobe Town herd management areas in southwest Wyoming’s Checkerboard region with 1,968 wild horses captured, separated from their family bands and shipped to holding facilities and 15 dead. On Tuesday, BLM captured 10 adult wild horses and five foals at Salt Wells Creek. 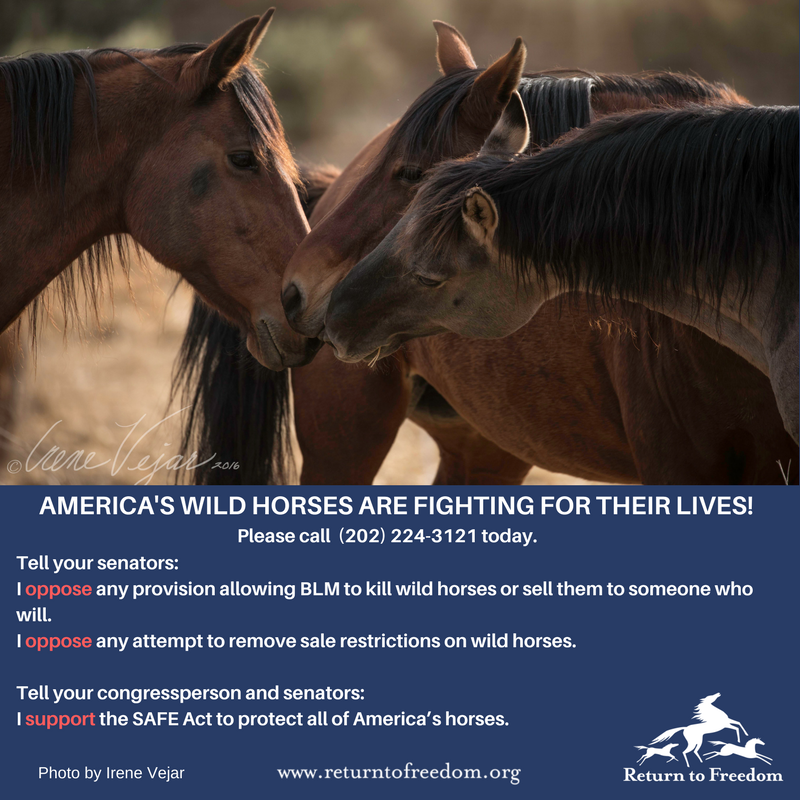 The agency set out to remove 1,560 of the BLM-estimated 2,836 wild horses from the three herd management areas, which include 1.7 million acres of public land. In a break from previous practice, the agency did not count foals and weanlings under age 1, and it only began releasing the number of foals captured after Return to Freedom and others raised questions about the daily totals. A U.S. District Court judge on Friday rejected a preliminary injunction filed requested by advocates, partly over the exclusion of foals from the target, allowing the roundup to continue. In all, 408 foals were captured in addition to 1,560 adults. Also on Tuesday, two wild horses were euthanized: a a 7-year-old stud with an “old fracture of left hind cannon bone with drainage” and a 9-year-old mare with a body condition of 2, (or “extremely thin”), on a nine-point scale, “with profound weakness in central nervous system.” All 15 wild horses that died during the roundup were euthanized for what BLM described for preexisting conditions with “a hopeless prognosis for recovery.” No veterinary reports have been posted. The roundup took place against the backdrop of a debate in Congress over whether to allow BLM to kill healthy unadopted wild horses and burros. The Salt Wells Creek / Great Divide Basin / Adobe Town HMAs are part of Wyoming’s Checkerboard: a largely unfenced region of alternating blocks of public and private or state land. The roundup took place over a combined 1.7 million acres of public land and 731,703 acres of private land.